Even the game’s staunchest defenders, whom I count myself amongst, are happy to admit that high level Hearthstone is a bit of a weird thing, given how big a part luck has to play. Whether it’s the order your deck is drawn, or the RNG effects integral to cards like Unstable Portal and Ram Wrangler, the result is that the most skilled player often won’t win. And when you see moments like this in the final of a major tournament, the inevitable response from chat is to spam ‘esports!’ and ‘casinostone’ in recognition that real winner was randomness. But you also get games like the one I’ve embedded above, which took place this weekend as part of the North American Last Call qualifying tournament for this year’s BlizzCon, where a $250,000 prize pool will be up for grabs. It’s a Mage mirror match between Andrey ‘Reynad’ Yanunk, founder of team Tempo Storm, salt lord, and occasional PC Gamer contributor, against the less well known Rage. 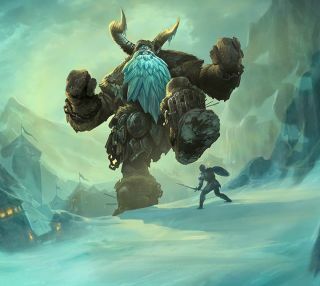 Whilst Reynad was running a fairly standard Freeze Mage list, which relies on stalling out the game until lethal damage can be administered by a barrage of burn spells, Rage’s deck was an Echo Giants build, (including the new Frost Giants which get cheaper the more you use your hero power), which aims to win the game by spamming cheap 8/8 minions. Both strategies depend on the game going long, and it did—with the players drawing their entire decks as it went to the wire. Obviously none of this means that plenty of Hearthstone games aren’t decided by big RNG swings, but I think a game like this one shows how deep the thought involved in Hearthstone can be, and goes some way to explaining why the competitive scene continues to grow explosively. It’s also worth noting that the play calling from Frodan and current BlizzCon champion Firebat was brilliant throughout, keeping viewers up to speed with the decisions the players were wrestling with. GGs to all involved.